Thanks! 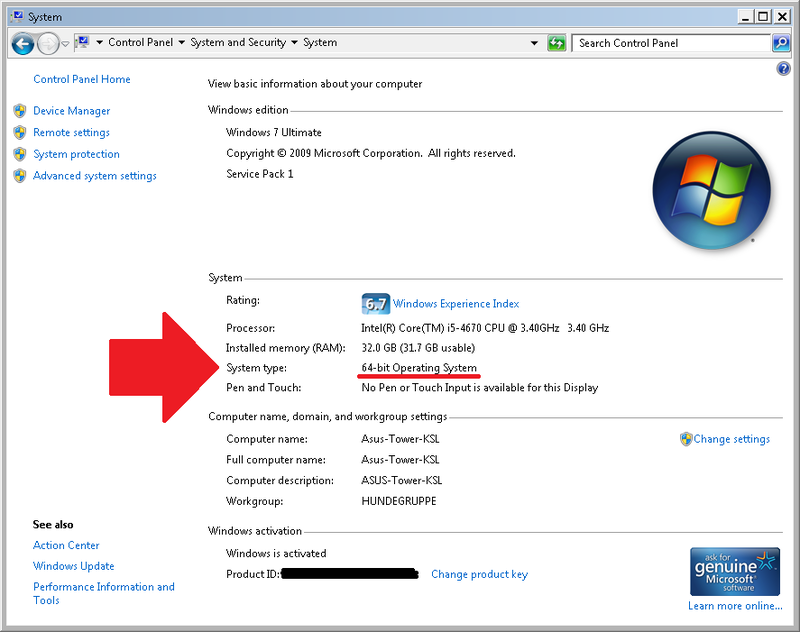 I switched to 64-bit as per your instructions. I'll let you know when my computer explodes! So, here's a curious thing: my Control Panel tells me my OS is 32-bit (Windows 7 Home Premium) but the shortcut I use to launch memoQ points to the 64-bit version. So… which version is running? And do I need to change the target of the shortcut? If you have the 32-bit OS then I think you should be running the 32-bit app. You can't access more RAM anyway. Good catch, Kevin. I have never suspected that MemoQ has a 64-bit support, so I am glad that I came across this post! 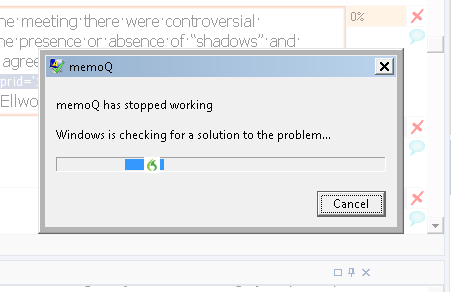 Seems that memoQ runs out of the available system resources. Please close some applications, open the Control Panel / System / Advanced system settings / Performance window, and increase the size of your Paging file. 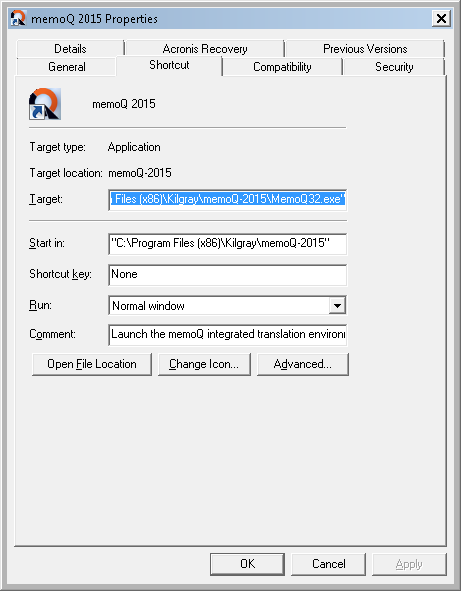 - If you have a 64 bit Operating System, run memoQ in 64 bit mode with the C:\Program Files (x86)\Kilgray\memoQ-2015\MemoQ.exe file. 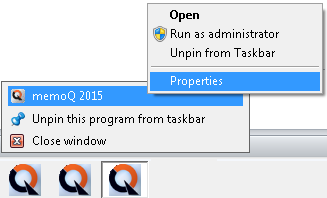 - Once memoQ is started open a Windows Task manager, find the MemoQ.exe process on the Details tab, and raise the priority to "High" by right clicking on it. Thank you, Kevin. This tip solved an issue for me with importing large Word files. Last week, I imported a large (50 MB) Word file into MemoQ 2015. It imported OK, but failed to create a preview. After reading your tip, I made sure that MemoQ actually loaded the 64-bit version of MemoQ, then tried the process again. Using 64-bit MemoQ (on a 64 bit machine, of course), MemoQ happily created the preview. 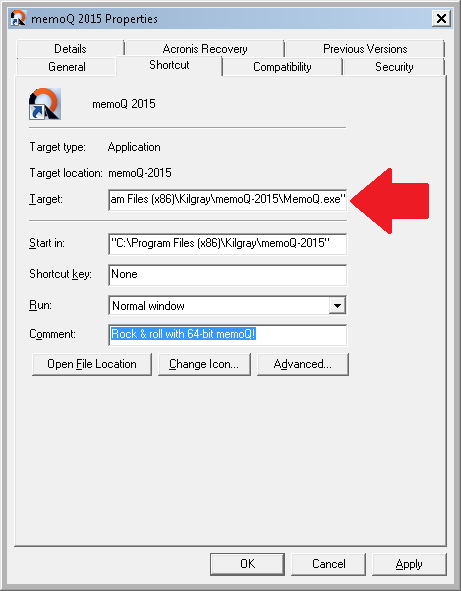 So, as you say, for some beefy processes, MemoQ's 64-bit version is the right way to go. (I'm also not noticing any sluggishness with the 64-bit version, either). The most obvious solutions are often the hardest to come up with ... thanks a million, Kevin, for blogging about this. I had performance problems with MemoQ, especially when working with Dragon, and now it all runs smoothly. This week's deadline would have been impossible to keep without this post! I'm glad this helped, Thomas. I've been reluctant to do posts of this sort lately, because it's discouraging to see how much idiotic misinformation can be found on social media and how often such errors are reinforced by errors propagated by the technology providers themselves.It's like bailing out the ocean with a teaspoon sometimes. But as long as a few decent folk trying to make an independent, ethical living can benefit, it's worthwhile. do you know it the 64-32 bits question is related to memoQ web search too? Unfortunately, this feature has been plagued with trouble for some time. It used to be that multiple instances of the web search window (Kilgray's mini-browser) would be generated from time to time (almost likethe application forgot there already was one); now I don't see that, but I get the same freezes and crashes if the web search window is open for a while. AFAIK this is due to a memory leak (sloppy programming), and it hasn't been fixed despite the fact that it has been an issue for most of this year. It seems to occur less frequently with me if I close the window after each search instead of just leave it open, but after working for a while I forget it again and... CRASH. Methinks it is time for the development team to focus less on new bells and whistles and more on stability. Thanks Kevin, I did what you suggested and have had no problems so far!! Much more speedier, thanks again! Thanks, it solved my problem, which seems to be related to the web-search window, too. The web search window in its current implementation has a serious memory leak, due to a long-unresolved bug in the underlying IE engine. If you don't close it periodically, there is likely to be some trouble. Kilgray Support has explained this in a few channels, but after a few years of this bother, it's probably time for the company to deal with it in some useful way, like an auto-kill above a specified memory usage or a different browser altogether. Thanks for this! I just started experiencing the "out of memory" issue and this easy-peasy fix solved it straight away.